What’s It About? Inspired by the true story of two Indian teenagers who won a baseball talent competition and signed contracts with the Pittsburgh Pirates, A Million Dollar Arm casts Jon Hamm (Mad Men) as ambitious sports agent JB Bernstein. 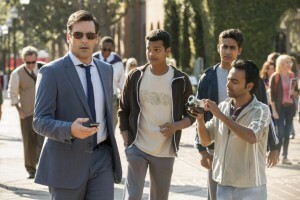 Bernstein left a successful sports agency to set up his own company, convincing co-worker Aash (Aasif Madvi) to follow him on the road to success, and the opening scenes depict the Mad Men star practising a client pitch to win NFL player Popo (Rey Maualuga) – Jon Hamm hasn’t exactly moved on to pastures new. Missing out on the big deal to transform his sports agency into a major player, JB has an eureka moment following a night on the tiles. Beguiled by the lightning speed of Indian cricket bowlers and the untapped resource of sporting talent, JB conjures up a talent competition to locate the Major League’s first Indian baseball players. Commissioned on behalf of Asian businessman Chang (Tzi Ma), JB flies to Mumbai, endeavouring to rake in gold and transform his floundering agency. Verdict: Director Craig Gillespie (Fright Night) attempts replication of Danny Boyle’s Slumdog Millionaire – box office success and a captivated subcontinent containing over one billion people. However, rather than flaunting India’s exotic pulse to a mainstream audience, A Million Dollar Arm falls short. Even with fast-moving handy-cams and soundtrack composer A. R. Rahman, successful ingredients of Slumdog Millionaire, the recipe fails to propel this movie into a must-see blockbuster and the Disneyfication makes for a rather mundane product. As JB searches, tirelessly, for baseball talent, A Million Dollar Arm utilises all Indian clichés to achieve its goals – populous cities, systems relying on bribery and the peoples’ love for sweet chai. But the picture loses out on prizes for ingenuity, sentimentalism and unswerving comedy – a couple of scenes with Aash prove entertaining but all in all, A Million Dollar Arm is just a bit silly. Alan Arkin, cast as professional baseball scout, provides the strongest, most natural, performance. Arkin’s one-liners provoke genuine laughs throughout the film’s 124 minutes. Winning the baseball talent competition , cricket players Dinesh (Madhur Mittal) and Rinku (Suraj Sharma), leave their rural villages for a fast-track tutorship in baseball – by the way, in real life neither individual ever played cricket. But despite the inspiring backdrop, A Million Dollar Arm is lacklustre in evoking sensitivity for the characters and we never learn much of Rinku or Dinesh – other than their rather dismal attempts to settle into Western culture and perfect their sporting techniques. Instead the picture focuses on JB’s transition from greedy consumerist sports agent to paternal figure for the boys, via coaxing from Brenda (Lake Bell), the cute girl-next-door. Final Words: But it’s not all swing and miss – overlooking the flaws and accepting foolishness, the pace is set for a movie that connects somewhat with the audience, in a shout-at-the-screen, dance-in-your-seat kind of way. A Million Dollar Arm entertains enough to warrant a watch. A Million Dollar Arm is out in UK cinemas now.